A modern microscope with a mercury bulb for fluorescence microscopy. The microscope has a digital camera, and is attached to a computer. The optical microscope, often referred to as light microscope, is a type of microscope which uses visible light and a system of lenses to magnify images of small samples. Optical microscopes are the oldest design of microscope and were possibly invented in their present compound form in the 17th century. Basic optical microscopes can be very simple, although there are many complex designs which aim to improve resolution and sample contrast. The image from an optical microscope can be captured by normal light-sensitive cameras to generate a micrograph. 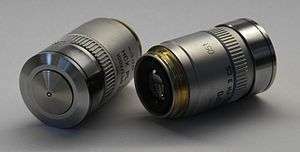 Originally images were captured by photographic film but modern developments in CMOS and charge-coupled device (CCD) cameras allow the capture of digital images. Purely digital microscopes are now available which use a CCD camera to examine a sample, showing the resulting image directly on a computer screen without the need for eyepieces. Alternatives to optical microscopy which do not use visible light include scanning electron microscopy and transmission electron microscopy. On 8 October 2014, the Nobel Prize in Chemistry was awarded to Eric Betzig, William Moerner and Stefan Hell for "the development of super-resolved fluorescence microscopy," which brings "optical microscopy into the nanodimension". There are two basic configurations of the conventional optical microscope: the simple microscope and the compound microscope. The vast majority of modern research microscopes are compound microscopes while some cheaper commercial digital microscopes are simple single lens microscopes. A magnifying glass is, in essence, a single lens simple microscope. In general, microscope optics are static; to focus at different focal depths the lens to sample distance is adjusted, and to get a wider or narrower field of view a different magnification objective lens must be used. 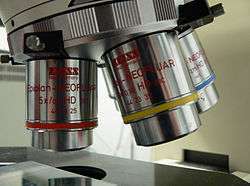 Most modern research microscopes also have a separate set of optics for illuminating the sample. A simple microscope is a microscope that uses a lens or set of lenses to enlarge an object through angular magnification alone, giving the viewer an erect enlarged virtual image. Simple microscopes are not capable of high magnification. The use of a single convex lens or groups of lenses are still found in simple magnification devices such as the magnifying glass, loupes, and eyepieces for telescopes and microscopes. A compound microscope is a microscope which uses a lens close to the object being viewed to collect light (called the objective lens) which focuses a real image of the object inside the microscope (image 1). That image is then magnified by a second lens or group of lenses (called the eyepiece) that gives the viewer an enlarged inverted virtual image of the object (image 2). The use of a compound objective/eyepiece combination allows for much higher magnification, reduced chromatic aberration and exchangeable objective lenses to adjust the magnification. A compound microscope also enables more advanced illumination setups, such as phase contrast. It is difficult to say who invented the compound microscope. The Dutch spectacle-maker Zacharias Janssen is sometimes claimed to have invented it in 1590 (a claim made by his son and fellow countrymen, in different testimony in 1634 and 1655). Another claim is that Janssen's competitor, Hans Lippershey, invented the compound microscope. Another favorite for the title of 'inventor of the microscope' was Galileo Galilei. 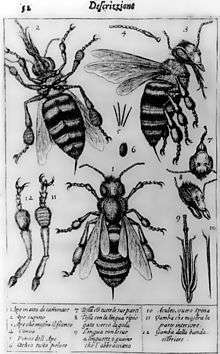 He developed an occhiolino or compound microscope with a convex and a concave lens in 1609. Galileo's microscope was celebrated in the Accademia dei Lincei in 1624 and was the first such device to be given the name "microscope" a year later by fellow Lincean Giovanni Faber. Faber coined the name from the Greek words μικρόν (micron) meaning "small", and σκοπεῖν (skopein) meaning "to look at", a name meant to be analogous with "telescope", another word coined by the Linceans. 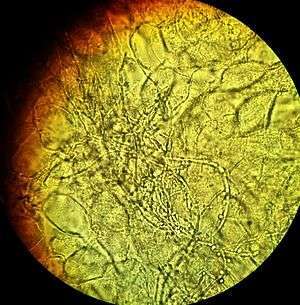 Christiaan Huygens, another Dutchman, developed a simple 2-lens ocular system in the late 17th century that was achromatically corrected, and therefore a huge step forward in microscope development. The Huygens ocular is still being produced to this day, but suffers from a small field size, and other minor disadvantages. Antonie van Leeuwenhoek (1632–1724) is credited with bringing the microscope to the attention of biologists, even though simple magnifying lenses were already being produced in the 16th century. Van Leeuwenhoek's home-made microscopes were simple microscopes, with a single very small, yet strong lens. They were awkward in use, but enabled van Leeuwenhoek to see detailed images. It took about 150 years of optical development before the compound microscope was able to provide the same quality image as van Leeuwenhoek's simple microscopes, due to difficulties in configuring multiple lenses. While basic microscope technology and optics have been available for over 400 years it is much more recently that techniques in sample illumination were developed to generate the high quality images seen today. In August 1893 August Köhler developed Köhler illumination. This method of sample illumination gives rise to extremely even lighting and overcomes many limitations of older techniques of sample illumination. Before development of Köhler illumination the image of the light source, for example a lightbulb filament, was always visible in the image of the sample. The Nobel Prize in physics was awarded to Dutch physicist Frits Zernike in 1953 for his development of phase contrast illumination which allows imaging of transparent samples. By using interference rather than absorption of light, extremely transparent samples, such as live mammalian cells, can be imaged without having to use staining techniques. Just two years later, in 1955, Georges Nomarski published the theory for differential interference contrast microscopy, another interference-based imaging technique. Modern biological microscopy depends heavily on the development of fluorescent probes for specific structures within a cell. In contrast to normal transilluminated light microscopy, in fluorescence microscopy the sample is illuminated through the objective lens with a narrow set of wavelengths of light. This light interacts with fluorophores in the sample which then emit light of a longer wavelength. It is this emitted light which makes up the image. Since the mid 20th century chemical fluorescent stains, such as DAPI which binds to DNA, have been used to label specific structures within the cell. More recent developments include immunofluorescence, which uses fluorescently labelled antibodies to recognise specific proteins within a sample, and fluorescent proteins like GFP which a live cell can express making it fluorescent. The eyepiece, or ocular lens, is a cylinder containing two or more lenses; its function is to bring the image into focus for the eye. The eyepiece is inserted into the top end of the body tube. Eyepieces are interchangeable and many different eyepieces can be inserted with different degrees of magnification. Typical magnification values for eyepieces include 5×, 10× (the most common), 15X and 20×. In some high performance microscopes, the optical configuration of the objective lens and eyepiece are matched to give the best possible optical performance. This occurs most commonly with apochromatic objectives. Objective turret, revolver, or revolving nose piece is the part that holds the set of objective lenses. It allows the user to switch between objective lenses. At the lower end of a typical compound optical microscope, there are one or more objective lenses that collect light from the sample. The objective is usually in a cylinder housing containing a glass single or multi-element compound lens. Typically there will be around three objective lenses screwed into a circular nose piece which may be rotated to select the required objective lens. These arrangements are designed to be parfocal, which means that when one changes from one lens to another on a microscope, the sample stays in focus. 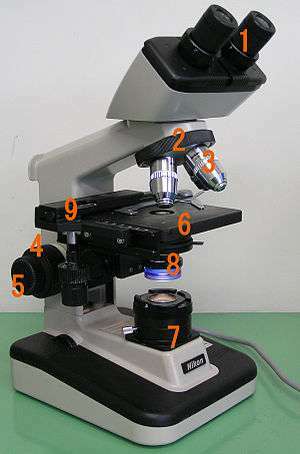 Microscope objectives are characterized by two parameters, namely, magnification and numerical aperture. The former typically ranges from 5× to 100× while the latter ranges from 0.14 to 0.7, corresponding to focal lengths of about 40 to 2 mm, respectively. Objective lenses with higher magnifications normally have a higher numerical aperture and a shorter depth of field in the resulting image. Some high performance objective lenses may require matched eyepieces to deliver the best optical performance. Some microscopes make use of oil-immersion objectives or water-immersion objectives for greater resolution at high magnification. These are used with index-matching material such as immersion oil or water and a matched cover slip between the objective lens and the sample. The refractive index of the index-matching material is higher than air allowing the objective lens to have a larger numerical aperture (greater than 1) so that the light is transmitted from the specimen to the outer face of the objective lens with minimal refraction. Numerical apertures as high as 1.6 can be achieved. The larger numerical aperture allows collection of more light making detailed observation of smaller details possible. An oil immersion lens usually has a magnification of 40 to 100×. Adjustment knobs move the stage up and down with separate adjustment for coarse and fine focusing. The same controls enable the microscope to adjust to specimens of different thickness. In older designs of microscopes, the focus adjustment wheels move the microscope tube up or down relative to the stand and had a fixed stage. The whole of the optical assembly is traditionally attached to a rigid arm, which in turn is attached to a robust U-shaped foot to provide the necessary rigidity. The arm angle may be adjustable to allow the viewing angle to be adjusted. The frame provides a mounting point for various microscope controls. Normally this will include controls for focusing, typically a large knurled wheel to adjust coarse focus, together with a smaller knurled wheel to control fine focus. Other features may be lamp controls and/or controls for adjusting the condenser. The stage is a platform below the objective which supports the specimen being viewed. In the center of the stage is a hole through which light passes to illuminate the specimen. The stage usually has arms to hold slides (rectangular glass plates with typical dimensions of 25×75 mm, on which the specimen is mounted). At magnifications higher than 100× moving a slide by hand is not practical. A mechanical stage, typical of medium and higher priced microscopes, allows tiny movements of the slide via control knobs that reposition the sample/slide as desired. If a microscope did not originally have a mechanical stage it may be possible to add one. All stages move up and down for focus. With a mechanical stage slides move on two horizontal axes for positioning the specimen to examine specimen details. Focusing starts at lower magnification in order to center the specimen by the user on the stage. Moving to a higher magnification requires the stage to be moved higher vertically for re-focus at the higher magnification and may also require slight horizontal specimen position adjustment. Horizontal specimen position adjustments are the reason for having a mechanical stage. Due to the difficulty in preparing specimens and mounting them on slides, for children it's best to begin with prepared slides that are centered and focus easily regardless of the focus level used. Many sources of light can be used. At its simplest, daylight is directed via a mirror. Most microscopes, however, have their own adjustable and controllable light source – often a halogen lamp, although illumination using LEDs and lasers are becoming a more common provision. The condenser is a lens designed to focus light from the illumination source onto the sample. The condenser may also include other features, such as a diaphragm and/or filters, to manage the quality and intensity of the illumination. For illumination techniques like dark field, phase contrast and differential interference contrast microscopy additional optical components must be precisely aligned in the light path. The actual power or magnification of a compound optical microscope is the product of the powers of the ocular (eyepiece) and the objective lens. The maximum normal magnifications of the ocular and objective are 10× and 100× respectively, giving a final magnification of 1,000×. When using a camera to capture a micrograph the effective magnification of the image must take into account the size of the image. This is independent of whether it is on a print from a film negative or displayed digitally on a computer screen. In the case of photographic film cameras the calculation is simple; the final magnification is the product of: the objective lens magnification, the camera optics magnification and the enlargement factor of the film print relative to the negative. A typical value of the enlargement factor is around 5× (for the case of 35mm film and a 15x10 cm (6×4 inch) print). In the case of digital cameras the size of the pixels in the CMOS or CCD detector and the size of the pixels on the screen have to be known. The enlargement factor from the detector to the pixels on screen can then be calculated. As with a film camera the final magnification is the product of: the objective lens magnification, the camera optics magnification and the enlargement factor. The optical components of a modern microscope are very complex and for a microscope to work well, the whole optical path has to be very accurately set up and controlled. Despite this, the basic operating principles of a microscope are quite simple. The objective lens is, at its simplest, a very high-powered magnifying glass, i.e. a lens with a very short focal length. This is brought very close to the specimen being examined so that the light from the specimen comes to a focus about 160 mm inside the microscope tube. This creates an enlarged image of the subject. This image is inverted and can be seen by removing the eyepiece and placing a piece of tracing paper over the end of the tube. By carefully focusing a brightly lit specimen, a highly enlarged image can be seen. It is this real image that is viewed by the eyepiece lens that provides further enlargement. In most microscopes, the eyepiece is a compound lens, with one component lens near the front and one near the back of the eyepiece tube. This forms an air-separated couplet. In many designs, the virtual image comes to a focus between the two lenses of the eyepiece, the first lens bringing the real image to a focus and the second lens enabling the eye to focus on the virtual image. In all microscopes the image is intended to be viewed with the eyes focused at infinity (mind that the position of the eye in the above figure is determined by the eye's focus). Headaches and tired eyes after using a microscope are usually signs that the eye is being forced to focus at a close distance rather than at infinity. Many techniques are available which modify the light path to generate an improved contrast image from a sample. Major techniques for generating increased contrast from the sample include cross-polarized light, dark field, phase contrast and differential interference contrast illumination. A recent technique (Sarfus) combines cross-polarized light and specific contrast-enhanced slides for the visualization of nanometric samples. Four examples of transilumination techniques used to generate contrast in a sample of tissue paper. 1.559 μm/pixel. Modern microscopes allow more than just observation of transmitted light image of a sample; there are many techniques which can be used to extract other kinds of data. Most of these require additional equipment in addition to a basic compound microscope. Multiple transmission microscopy for contrast enhancement and aberration reduction. Optical microscopy is used extensively in microelectronics, nanophysics, biotechnology, pharmaceutic research, mineralogy and microbiology. Optical microscopy is used for medical diagnosis, the field being termed histopathology when dealing with tissues, or in smear tests on free cells or tissue fragments. In industrial use, binocular microscopes are common. Aside from applications needing true depth perception, the use of dual eyepieces reduces eye strain associated with long workdays at a microscopy station. In certain applications, long-working-distance or long-focus microscopes are beneficial. An item may need to be examined behind a window, or industrial subjects may be a hazard to the objective. Such optics resemble telescopes with close-focus capabilities. Stereo microscope, a low-powered microscope which provides a stereoscopic view of the sample, commonly used for dissection. Comparison microscope, which has two separate light paths allowing direct comparison of two samples via one image in each eye. Inverted microscope, for studying samples from below; useful for cell cultures in liquid, or for metallography. Student microscope, designed for low cost, durability, and ease of use. Petrographic microscope, whose design usually includes a polarizing filter, rotating stage and gypsum plate to facilitate the study of minerals or other crystalline materials whose optical properties can vary with orientation. Polarizing microscope, similar to the petrographic microscope. Phase contrast microscope, which applies the phase contrast illumination method. Epifluorescence microscope, designed for analysis of samples which include fluorophores. Confocal microscope, a widely used variant of epifluorescent illumination which uses a scanning laser to illuminate a sample for fluorescence. A digital microscope is a microscope equipped with a digital camera allowing observation of a sample via a computer. Microscopes can also be partly or wholly computer-controlled with various levels of automation. Digital microscopy allows greater analysis of a microscope image, for example measurements of distances and areas and quantitaton of a fluorescent or histological stain. 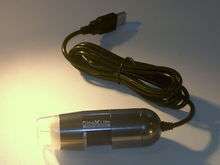 Low-powered digital microscopes, USB microscopes, are also commercially available. These are essentially webcams with a high-powered macro lens and generally do not use transillumination. The camera attached directly to the USB port of a computer, so that the images are shown directly on the monitor. They offer modest magnifications (up to about 200×) without the need to use eyepieces, and at very low cost. High power illumination is usually provided by an LED source or sources adjacent to the camera lens. Usually a wavelength of 550 nm is assumed, which corresponds to green light. With air as the external medium, the highest practical NA is 0.95, and with oil, up to 1.5. In practice the lowest value of d obtainable with conventional lenses is about 200 nm. A new type of lens using multiple scattering of light allowed to improve the resolution to below 100 nm. Multiple techniques are available for reaching resolutions higher than the transmitted light limit described above. Holographic techniques, as described by Courjon and Bulabois in 1979, are also capable of breaking this resolution limit, although resolution was restricted in their experimental analysis. Using fluorescent samples more techniques are available. Examples include Vertico SMI, near field scanning optical microscopy which uses evanescent waves, and stimulated emission depletion. In 2005, a microscope capable of detecting a single molecule was described as a teaching tool. Despite significant progress in the last decade, techniques for surpassing the diffraction limit remain limited and specialized. 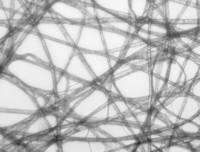 While most techniques focus on increases in lateral resolution there are also some techniques which aim to allow analysis of extremely thin samples. 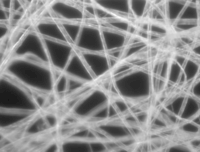 For example, sarfus methods place the thin sample on a contrast-enhancing surface and thereby allows to directly visualize films as thin as 0.3 nanometers. SMI (spatially modulated illumination microscopy) is a light optical process of the so-called point spread function (PSF) engineering. These are processes which modify the PSF of a microscope in a suitable manner to either increase the optical resolution, to maximize the precision of distance measurements of fluorescent objects that are small relative to the wavelength of the illuminating light, or to extract other structural parameters in the nanometer range. SPDM (spectral precision distance microscopy), the basic localization microscopy technology is a light optical process of fluorescence microscopy which allows position, distance and angle measurements on "optically isolated" particles (e.g. molecules) well below the theoretical limit of resolution for light microscopy. "Optically isolated" means that at a given point in time, only a single particle/molecule within a region of a size determined by conventional optical resolution (typically approx. 200–250 nm diameter) is being registered. This is possible when molecules within such a region all carry different spectral markers (e.g. different colors or other usable differences in the light emission of different particles). Many standard fluorescent dyes like GFP, Alexa dyes, Atto dyes, Cy2/Cy3 and fluorescein molecules can be used for localization microscopy, provided certain photo-physical conditions are present. Using this so-called SPDMphymod (physically modifiable fluorophores) technology a single laser wavelength of suitable intensity is sufficient for nanoimaging. 3D super resolution microscopy with standard fluorescent dyes can be achieved by combination of localization microscopy for standard fluorescent dyes SPDMphymod and structured illumination SMI. 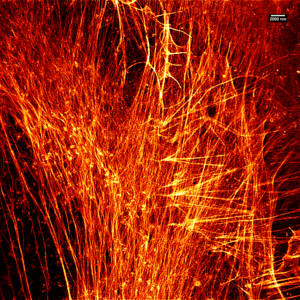 Stimulated emission depletion (STED) microscopy image of actin filaments within a cell. Stimulated emission depletion is a simple example of how higher resolution surpassing the diffraction limit is possible, but it has major limitations. STED is a fluorescence microscopy technique which uses a combination of light pulses to induce fluorescence in a small sub-population of fluorescent molecules in a sample. Each molecule produces a diffraction-limited spot of light in the image, and the centre of each of these spots corresponds to the location of the molecule. As the number of fluorescing molecules is low the spots of light are unlikely to overlap and therefore can be placed accurately. This process is then repeated many times to generate the image. Stefan Hell of the Max Planck Institute for Biophysical Chemistry was awarded the 10th German Future Prize in 2006 and Nobel Prize for Chemistry in 2014 for his development of the STED microscope and associated methodologies. In order to overcome the limitations set by the diffraction limit of visible light other microscopes have been designed which use other waves. It is important to note that higher frequency waves have limited interaction with matter, for example soft tissues are relatively transparent to X-rays resulting in distinct sources of contrast and different target applications. The use of electrons and X-rays in place of light allows much higher resolution – the wavelength of the radiation is shorter so the diffraction limit is lower. To make the short-wavelength probe non-destructive, the atomic beam imaging system (atomic nanoscope) has been proposed and widely discussed in the literature, but it is not yet competitive with conventional imaging systems. STM and AFM are scanning probe techniques using a small probe which is scanned over the sample surface. Resolution in these cases is limited by the size of the probe; micromachining techniques can produce probes with tip radii of 5–10 nm. Additionally, methods such as electron or X-ray microscopy use a vacuum or partial vacuum, which limits their use for live and biological samples (with the exception of an environmental scanning electron microscope). The specimen chambers needed for all such instruments also limits sample size, and sample manipulation is more difficult. Color cannot be seen in images made by these methods, so some information is lost. They are however, essential when investigating molecular or atomic effects, such as age hardening in aluminium alloys, or the microstructure of polymers. ↑ Ritter, Karl; Rising, Malin (8 October 2014). "2 Americans, 1 German win chemistry Nobel". AP News. Retrieved 8 October 2014. ↑ Shmaefsky, Brian (2006) Biotechnology 101. Greenwood. p. 171. ISBN 0313335281. ↑ Note: stories vary, including Zacharias Janssen had the help of his father Hans Janssen (or sometimes said to have been built entirely by his father). Zacharias' probable birth date of 1585 (Van Helden, p. 28) makes it unlikely he invented it in 1590 and the claim of invention is based on the testimony of Zacharias Janssen's son, Johannes Zachariassen, who may have fabricated the whole story (Van Helden, p. 43). ↑ Gould, Stephen Jay (2000) The Lying Stones of Marrakech. Harmony Books. ISBN 0-609-60142-3. ↑ Kenneth, Spring; Keller, H. Ernst; Davidson, Michael W. "Microscope objectives". Olympus Microscopy Resource Center. Retrieved 29 Oct 2008. ↑ N. C. Pégard and J. W. Fleischer, "Contrast Enhancement by Multi-Pass Phase-Conjugation Microscopy," CLEO:2011, paper CThW6 (2011). ↑ "Long-focus microscope with camera adapter". macrolenses.de. ↑ "Questar Maksutov microscope". company7.com. ↑ "FTA long-focus microscope". firsttenangstroms.com. ↑ "Buying a cheap microscope for home use" (PDF). Oxford University. Retrieved 5 November 2015. ↑ Van Putten, E. G.; Akbulut, D.; Bertolotti, J.; Vos, W. L.; Lagendijk, A.; Mosk, A. P. (2011). "Scattering Lens Resolves Sub-100 nm Structures with Visible Light". Physical Review Letters. 106 (19). arXiv:1103.3643 . doi:10.1103/PhysRevLett.106.193905. ↑ Courjon, D.; Bulabois, J. (1979). "Real Time Holographic Microscopy Using a Peculiar Holographic Illuminating System and a Rotary Shearing Interferometer". Journal of Optics. 10 (3): 125. Bibcode:1979JOpt...10..125C. doi:10.1088/0150-536X/10/3/004. ↑ "Demonstration of a Low-Cost, Single-Molecule Capable, Multimode Optical Microscope". Retrieved 25 February 2009. ↑ Heintzmann, Rainer (1999). "Laterally modulated excitation microscopy: Improvement of resolution by using a diffraction grating". Laterally modulated excitation microscopy: improvement of resolution by using a diffraction grating. Optical Biopsies and Microscopic Techniques III. 3568. pp. 185–196. doi:10.1117/12.336833. ↑ Lemmer, P.; Gunkel, M.; Baddeley, D.; Kaufmann, R.; Urich, A.; Weiland, Y.; Reymann, J.; Müller, P.; Hausmann, M.; Cremer, C. (2008). "SPDM: light microscopy with single-molecule resolution at the nanoscale". Applied Physics B. 93: 1–12. doi:10.1007/s00340-008-3152-x. ↑ Bradl, Joachim (1996). "Comparative study of three-dimensional localization accuracy in conventional, confocal laser scanning and axial tomographic fluorescence light microscopy". Comparative study of three-dimensional localization accuracy in conventional, confocal laser scanning and axial tomographic fluorescence light microscopy. Optical Biopsies and Microscopic Techniques. 2926. pp. 201–206. doi:10.1117/12.260797. ↑ Heintzmann, R.; Münch, H.; Cremer, C. (1997). "High-precision measurements in epifluorescent microscopy – simulation and experiment" (PDF). Cell Vision. 4: 252–253. ↑ Manuel Gunkel; et al. (2009). "Dual color localization microscopy of cellular nanostructures". Biotechnology journal. 4 (6): 927–38. doi:10.1002/biot.200900005. PMID 19548231. ↑ Kaufmann, R; Müller, P; Hildenbrand, G; Hausmann, M; Cremer, C; et al. (2011). "Analysis of Her2/neu membrane protein clusters in different types of breast cancer cells using localization microscopy". Journal of Microscopy. 242 (1): 46–54. doi:10.1111/j.1365-2818.2010.03436.x. PMID 21118230. ↑ "German Future Prize for crossing Abbe's Limit". Retrieved 24 February 2009. Van Helden, Albert; Dupre, Sven; Van Gent, Rob (2011). The Origins of the Telescope. Amsterdam University Press. ISBN 9069846152. "Metallographic and Materialographic Specimen Preparation, Light Microscopy, Image Analysis and Hardness Testing", Kay Geels in collaboration with Struers A/S, ASTM International 2006. "Light Microscopy: An ongoing contemporary revolution", Siegfried Weisenburger and Vahid Sandoghdar, arXiv:1412.3255 2014.